The Fairfax District is a neighborhood in the Central Los Angeles region of the city of Los Angeles, California. Historically the Fairfax District has been a center of the Jewish community in Los Angeles. It is known for the Farmer's Market, The Grove, CBS Television City broadcasting center, the Los Angeles Museum of the Holocaust in Pan Pacific Park, and Fairfax Avenue restaurants and shops. Beverly-Fairfax (sometimes simply called Fairfax) is a 3.2-square-mile neighborhood bordered by Willoughby Avenue on the north, Wilshire Boulevard on the south, La Brea Avenue on the east, and La Cienega Boulevard on the west. 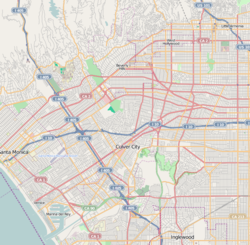 According to the Mapping L.A. project of the Los Angeles Times, the Fairfax District is flanked on the north and northeast by the city of West Hollywood, on the northeast by Hollywood, on the east by Hancock Park, on the south by Mid-Wilshire, and on the west by Beverly Grove. Street boundaries are Willoughby Avenue or Romaine Street on the north, La Brea Avenue on the east, West Third Street on the south, and Fairfax Avenue on the west. The Beverly-Fairfax (or Fairfax) neighborhood, as it has historically been called, includes both Fairfax and Beverly Grove. In the first draft of Mapping L.A., "Beverly Grove" was not included as a distinct neighborhood; rather, the area was shown as part of Fairfax. The 2000 U.S. census counted 12,490 residents in the 1.23-square-mile Fairfax District—an average of 10,122 people per square mile, about the same population density as all of Los Angeles. In 2008, the city estimated that the population had increased to 13,360. The median age for residents was 33, a general average within Los Angeles. The percentage of residents aged 65 and older was among the county's highest. Fifty-four percent of Fairfax residents aged 25 and older had earned a four-year degree by 2000, a high figure for both the city and the county. The median yearly household income in 2008 dollars was $65,938, average in comparison to the rest of Los Angeles. The average household size of two people was low for the city of Los Angeles. Renters occupied 71.5% of the housing stock, and house- or apartment owners 28.5%. The percentages of never-married men (54.9%) and never-married women (45.5%) were among the county's highest. The neighborhood was "not especially diverse" ethnically, with a high percentage of white people. The breakdown was whites, 84.7%; Latinos, 5.9%; Asians, 4.5%; blacks, 2.2%, and others, 2,8%. Ukraine (8.9%) and Mexico (7.8%) were the most common places of birth for the 23.2% of the residents who were born abroad, a low ratio compared to the rest of Los Angeles. Canter's deli, a notable Fairfax restaurant. Historically, the Fairfax District has been a center of the Jewish community in Los Angeles, after the earlier Boyle Heights period, which was home to largest Jewish community west of Chicago in the 1920s and 1930s. In 1935, there were four synagogues in the Fairfax District; by 1945, there were twelve. After World War II, more Jews began to populate the area. As more families moved in, religious schools and a Jewish Community Center sprang up. In 1974, Bet Tzedek Legal Services - The House of Justice, a legal aid charity, opened its doors across from the Farmers Market. The Farmers Market at Fairfax Avenue and 3rd Street still retains a 1930s atmosphere, with open-air vegetable stalls and cafes, and many Jewish residents of the area still frequent the market as part of their shopping or kibbitzing routine. The Grove, a commercial retail and entertainment center, opened in 2002 next to the Farmer's Market. The intersection of Fairfax Avenue and Beverly Boulevard is officially recognized as Raoul Wallenberg Square, in honor of the Swedish diplomat who saved thousand of Hungarian Jews from deportation to Nazi death camps. The Los Angeles Museum of the Holocaust is located nearby, within Pan Pacific Park. CBS Television City was built in 1952 on the former site of Gilmore Stadium at Fairfax Avenue and Beverly Boulevard. The facility has been used to tape several shows both for CBS and other entities, the most notable being The Price is Right, which has shot in Studio 33 (later renamed for the game show's longtime host, Bob Barker) continuously since 1972. In the 90s the strip became much more popular when it gained a notable nightlife. Today the street is covered with designer clothing stores and popular restaurants, like Animal, a restaurant. It is also known for popular street art, and street culture. Fairfax High School, LAUSD, 7850 Melrose Avenue. The school was founded in 1924. Most of the original campus facilities were demolished in 1966 because the original Spanish Colonial Revival main building did not meet earthquake safety standards. The historic Dewitt Swann Auditorium and iconic Rotunda, however, were spared, retrofitted and are in daily use. Greenway Court, built in 1939 as a social hall by the students at Fairfax as a class project, was also spared and was moved to Fairfax Avenue, where it was converted into a theater in 1999 by the Greenway Arts Alliance and renamed the Greenway Court Theater. Canter's restaurant. Los Angeles magazine named Canter's waffles the Best Waffle in Los Angeles. Esquire magazine called Canter's Monte Cristo sandwich one of the best sandwiches in America. CBS Television City, which was built on the site of a former football field and race track and which opened on November 16, 1952. Farmers Market, consisting of food stalls, sit-down eateries, prepared food vendors and produce markets. The Grove, a shopping center that features a large center park with an animated fountain. Pan-Pacific Park on Third Avenue, built on the site of the former Pan-Pacific Auditorium. Location of the Los Angeles Museum of the Holocaust. ^ a b "LOS ANGELES TIMES MAGAZINE MAP No. 7 : BEVERLY-FAIRFAX". Los Angeles Times Magazine. 13 April 1986. ^ Architectural Resources Group, Inc. (23 January 2015). "Historic Resources Survey Report: Wilshire Community Plan Area" (PDF). SurveyLA. ^ Romo, Ricardo. East Los Angeles: History of a Barrio. University of Texas Press, July 5, 2010. ISBN 0292787715, 9780292787711. p. 95. ^ Review of Canter's Deli, giving award for Best Waffle Archived January 14, 2010, at the Wayback Machine, Los Angeles, April 2005. ^ The Best Sandwiches in America, Esquire Magazine, February 2008. ^ Bronson, Fred (December 2002). Billboard's Hottest Hot 100 Hits. Watson-Guptill Publications. ISBN 0-8230-7646-6. This page was last edited on 24 December 2018, at 16:56 (UTC).